The ancient science of Vedic astrology can identify specific astrological phases that possess the potential of posing harm to an individual. Sadhesati of Shani is one such astrological phase. This phase starts when Saturn or Shani enters the house immediately preceding the moon sign of an individual. This is the most dreaded of astrological phases and lasts for a period of seven and half years which is why the name Sadhesati. When Saturn or Shani transits in the 4th sign after the moon sign, it is called the Dhaiyya and when Saturn or Shani moves through the 8th sign from the birth sign it is called the Ashtam Shani. Our highly qualified sand experienced astrologers at Starstell can solve all your worries in no time once you seek their assistance. This report provides you with a comprehensive analysis of Saturn’s movement and its impact on your birth chart. We also provide you guidance and assistance to minimize the negative effects of Saturn’s transit on your birth chart. So order a complete Shani Sadhesati Report and receive expert assistance to ward off the ill-effects of Sadhesati. Once you have provided all the necessary information such as your full name, date of birth, time of birth, place of birth etc. on your personal profile page, our master astrologer will prepare the Shani Sadhesati Report for you. You will be taken back to your personal profile page to complete this order once you click the Buy Now Button. 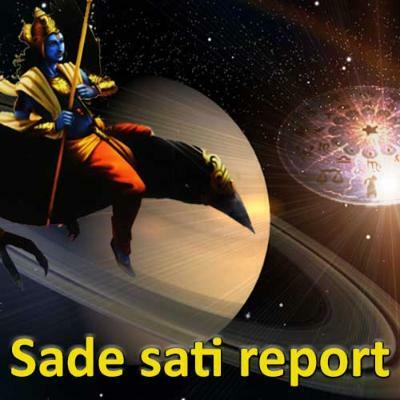 The Shani Sadhesati Report will be sent to you as email pdf attachment within 5-7 working days and will cover all the aspects of the report mentioned above. We will also send you the hard copy (if you are a resident of India) of the same on your registered postal address within 10-15 working days. For more information about the Shani Sadhesati Report, our other reports, products and services, please do not hesitate to call or write to us at support@starstell.com and we will be happy to assist you.